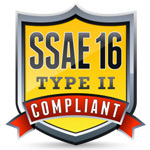 What is the SSAE 16 Type II compliance standard? SOC 1-SSAE 16 Type II is the attestation standard put forth by the American Institute of Certified Public Accountants (“AICPA”). The SOC 1-SSAE 16 standard effectively replaced the SAS 70 auditing standard, which was used for over 20 years. Why choose a data center compliant with the SSAE 16 Type II attestation standard? The SSAE 16 Type II is a step above SAS 70 due to the ability to validate the controls and processes, and also requires a written declaration regarding the design and operating effectiveness of the controls being analyzed. SSAE 16 Type II standards are especially important for companies within the healthcare, banking or government industries that are mandated to follow strict industry guidelines. The fact that SymQuest has achieved compliance with SSAE 16 Type II standards demonstrates that the Data Center and Hosting Services have been reviewed and tested by an independent certified public accounting firm and validates that our controls and processes are suitably designed and operated effectively to protect and safeguard customer’s equipment and data.